So apparently others have stumbled upon this but when doing my rebuild of RTM over the weekend I noticed a nifty little error popping up in the event log that raised a little concern with regard to the TaxonomyPicker user control. 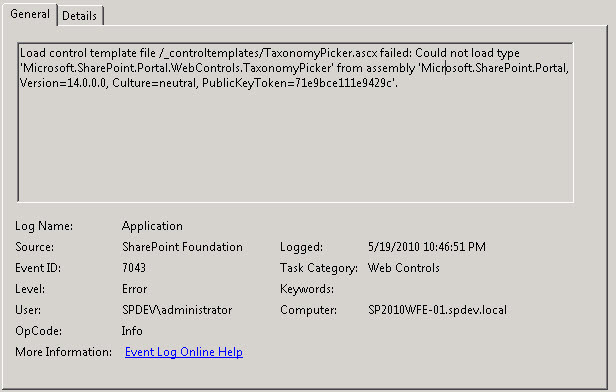 Looking at the error, you’ll notice that it states the TaxonomyPicker.ascx user control can’t register an assembly ‘Microsoft.SharePoint.Portal.WebControls.TaxonomyPicker’ from assembly ‘Microsoft.SharePoint.Portal, Version=14.0.0.0, Culture=neutral, PublicKeyToken=71e9bce111e9429c’. 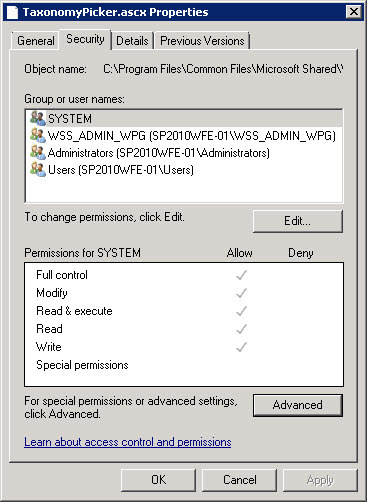 So the fix, simply navigate to the 14 root at: %systemroot%Program FilesCommon FilesMicrosoft SharedWeb Server Extensions14TEMPLATECONTROLTEMPLATES where you’ll find the TaxonomyPicker.ascx user control. First – make a copy of the file and save it as perhaps TaxonomyPicker.ascx_backup or something along those lines – what works for you, run with it. Next using your favourite text editor (TextPad for me), open the user control and observe in the first line the error. Save the user control and restart the app pool and presto, the error should be no more. And with that, you’re done. Happy tuning. Update – Apparently the error will continue to persist even after making the correction to the file. Looking in the Microsoft.SharePoint.Portal Assembly it looks like there is no actual TaxonomyPicker class, so in reality you can just keep the copied file (TaxonomyPicker.ascx_broken) and remove the fixed version. That being said, until the TaxonomyPicker class is implemented within the Microsoft.SharePoint.Portal assembly, you’re safe in not worrying about this user control. So was this an issue in Beta2?